In February 2006, Sankofa Strings, a progressive collective comprised of percussionist Sule Greg Wilson along with multi-instrumentalist Dom Flemons and singer Rhiannon Giddens, from the Grammy-Award Winning Carolina Chocolate Drops, were taped in concert for inclusion in the award-winning jug band documentary Chasin’ Gus’ Ghost (http://www.chasingusghost.com), a film which chronicles a worldwide quest to assemble a comprehensive lineage to Gus Cannon, a seminal figure in the history of American music. Duly impressed by Sankofa Strings and their refreshing melting pot of century-old traditional string band music, jazz, folk and blues coated in the context of modern arrangement, Chasin’ Gus’ Ghost Producer/director Todd Kwait offered the band an opportunity to record an album at Nevessa Production in Woodstock, NY, a studio that specializes in recording acoustic orchestras. Joining the groundbreaking ensemble for their historical exploration is John Sebastian, founder of the Lovin’ Spoonful, a Rock ‘N Roll Hall Fame Inductee From Pandeiro and Bodhran drums to accordion and maracas to kazoo and tambourine to jugs, bones and washboard, The Uptown Strut deftly glides the gamut of instrumentation with Sebastian adding a Baritone guitar and harmonica on the exquisite “If Wishes Were Gold” with a sultry lead vocal by Allison Russell. The Strut saddles up at a sonic hookah as Sebastian hydroponically blends with Wilson and Flemons on “Weed Smoker’s Dream,” a sophisticated traipse of the Harlem Hamfats tune from 1936 that clocks out at exactly four minutes and 20 seconds after an extended exhale of Cab Calloway’s “Minnie The Moocher”. Further cuts include a Gospel-infused re-working of Ray Charles’ number one hit “Let’s Go Get Stoned,” with a soul-baring lead vocal by Ndidi Onukwulu, “What’s The Use of Getting Sober,” Louie Jordan’s first number one hit in 1942, and the 1930s-era Dixieland roll of “Don’t You Make Me High”. Other storied sign posts in downtown Uptown are “The Old Folks Started It,” a take on the 1929 Minnie Wallace tune which also references Shelton Brooks’ 1917 hit “Darktown Strutter’s Ball,” “Sing Sing Prison Blues,” a nod to Bessie Smith’s 1924 recording and a, literally, bare-boned rendition of “Jump Jim Crow,” an early American treasure originally “collected” by blackface minstrel Thomas “Daddy” Rice in 1828. The group dropped “Strings” from its moniker to put focus on the aesthetic beauty and prescient meaning of “Sankofa,” a word in the Akan language of Ghana that translates in English to “go back and get it” (san – to return; ko – to go; fa – to look, to seek and take). Visually represented by an Adinkra symbol of a bird with its head turned backwards taking an egg off its back, Sankofa symbolizes one taking from the past what is good and bringing it into the present in order to make positive progress through the benevolent use of knowledge. 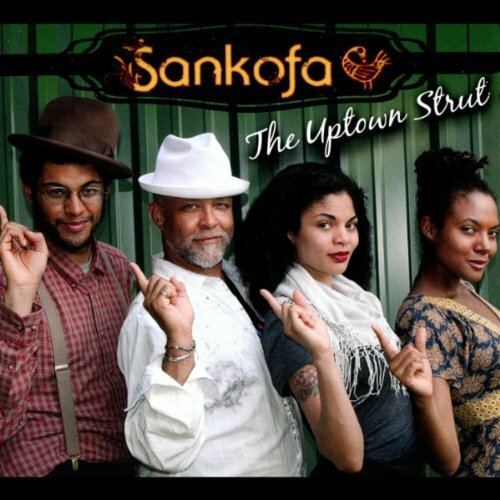 Emboldened by a confident uptown strut, the majestic bird of Sankofa faces forward toward the enlightened to boldly fly high into the musical future.